Theatre critic with the New York Tribune and as a freelance contributor to the National Geographic Society. In 1919 Solita started a relationship the journalist Janet Flanner. They travelled together to Greece and France. In Paris they joined the lesbian circles of Gertrude Stein & Alice B. Toklas and their friends. In 1929 Solita had an affair with Margaret Anderson which lasted several years, although Margaret stayed with her lover Georgette Leblanc throughout. At the outbreak of WWII Solita and Janet returned to America. Solita eventually left Janet after she started an affair with Natalia Danesi Murray. Solita then fell in love with Elizabeth Jenks Clark. She remained close friends with Margaret, who was now in love with Dorothy Caruso. Phew! are you still with me? A busy girl. After the war Solita returned to France, where she lived until her death. I guess she can come to the party – after all most of her friends will be there. 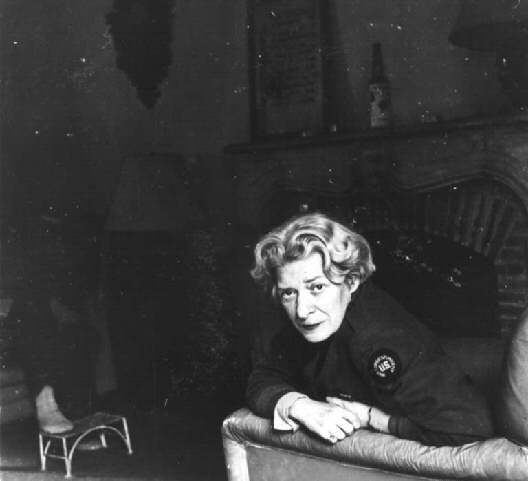 Today we raise a glass to Janet Flanner, March 13 1892 – November 7 1978. Janet was a journalist, writing for the New Yorker, and as a war correspondent. She lived in Greenwich Village and there met and fell in love with Solita Solano (Sarah Wilkinson). Janet and Solita featured as Nip and Tuck, a pair of journalists in Djuna Barnes’s Ladies Almanac (1928). During this time she wrote her novel The Cubical City. Although she loved Greenwich Village Janet wanted to get out of the city and eventually ended up in Paris, where they became friends with Natalie Barney, Gertrude Stein and many other ex-pat American Lesbians. Janet sent articles to the New Yorker from Paris under the pseudonym Genêt, and later from London. When war broke out they moved back to New York and Janet met Natalia Murray, fell in love and moved in with her, helping her raise her son. This did not put an end to her relationship with Solita. After the war Janet returned to Europe and Solita, covering the war trials, and the devastation the war had left behind. When Solita died, she moved back to America and to Natalia, and when she died, her and Natalia’s ashes were scattered together where they had first met.